This small Bodhisattva may be identified as an aspect of Avalokitesvara, holding a branch of willow over his right shoulder and a flask in his left hand. In the central triangular panel of his crown, a small seated Buddha may just be discerned. 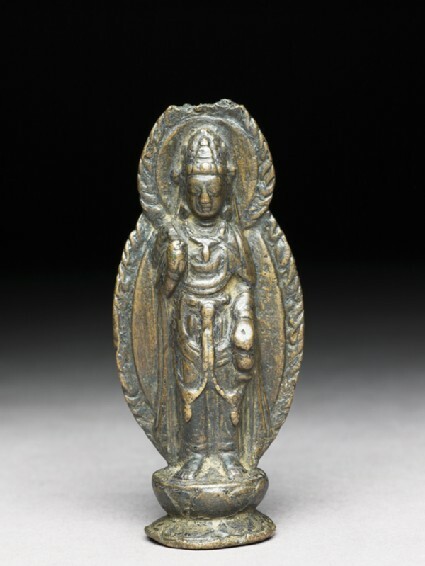 The Bodhisattva is wearing a necklace and an elaborate chain belt with jewel pendants at knee level above his thin dhoti. The long sashes of the scarves which pass from his shoulders fall in very small naturalistic pleats at his ankles. His body is perfectly straight. This pure frontality, the narrow scarves, and the elongated chains draped to the knees recall early tenth-century paintings of Avalokitesvara from Dunhuang . The crown with fan-shaped extensions at the temples does not exhibit the typical ribbons or florets of the crowns at Dunhuang, but instead recalls Kashmiri models, as does the very simple form of the flames on the lotus surround . Although the upper portion of the halo is broken, it appears that it came to a small point, in contrast with the circular halo around his head. The figure appears within an oval prabha, as narrow at the shoulder level as at the ankle, differentiating it from the Kashmiri ovoid prabha models which are wider at the shoulder level. On the reverse, a word written in Tibetan alphabet non-cursive letters is modelled in relief. It was thus modelled at the same time as the casting of the image, which is very thin and solid cast. This syllable may be read as Hri, a syllable for sacred incantation, although the artist has slightly misaligned the vowel. There are two vertically aligned circles as punctuation, which is typical of Tibetan inscriptions on stone steles and on silver during the eighth to ninth century . This Tibetan inscription and the use of certain conventions from the Western Himalaya point to the period of the Tibetan occupation of Dunhuang, or shortly after. The image is said to have been acquired in Yunnan, where the Nanzhao kingdom was in close alliance with the Tibetans in the second half of the eighth century. As troops and monks were then travelling from Qinghai to Yunnan via the Mekong river, it is possible that the image was made in Dunhuang and then carried to Yunnan. In its metal alloy and its iconography, stylistic conventions of the draperies and ornate prabha, it is formally quite distinct from the local Nanzhao sculptures of the ninth to tenth century . 1 Whitfield and Farrer, Caves of the Thousand Buddhas, pl. 12, dated 910 ad. 2 Reedy, Himalayan Bronzes (k 51): Tathagata Amoghasiddhi, Kashmir, 8th–9th century. 3 Compare this punctuation on the 779 ad inscribed stone stele from Samye (bsam yas): Richardson, A Corpus of Early Tibetan Inscriptions, pl. 4. 4 Lutz, Der Tempel der Drei Pagoden von Dali, Abb. 100.